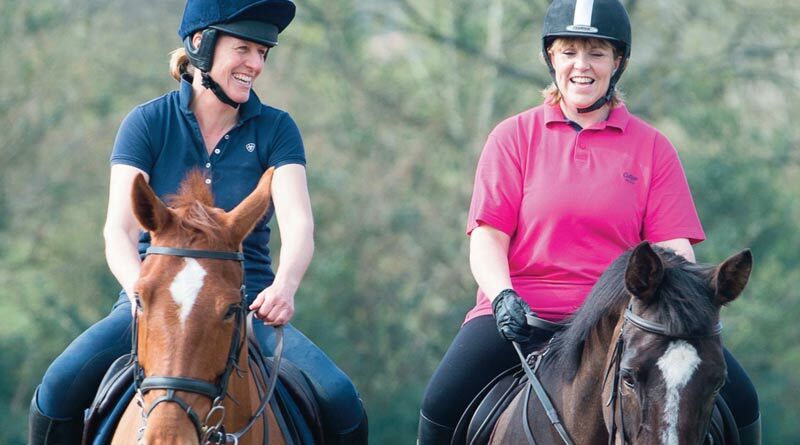 Female equestrians are being urged to download a new guide to help avoid breast pain while riding horses. The Horse Rider’s Guide to Bras is based on a large-scale study by Dr Jenny Burbage, of the University of Portsmouth, and Lorna Cameron, of Sparsholt College, Hampshire. The information leaflet has been created by the British Equestrian Trade Association (BETA) in conjunction with the British Equestrian Federation. The research by Burbage and Cameron revealed that 40 per cent of 1324 riders surveyed experienced breast pain, which was significantly related to increased cup size, and at least one bra issue was reported by 59 per cent of participants. Surprisingly, fewer than 35 per cent of female riders wear a sports bra and more than 70 per cent of women are reported to be wearing the wrong size. The Horse Rider’s Guide to Bras seeks to address this problem by offering four pages of guidance and tips on how to secure the perfect fit. “We thought that the study undertaken by Dr Jenny Burbage and Lorna Cameron would be of great interest to both riders and retail members who stock sports and rider-specific bras in-store,” said BETA executive director Claire Williams. The findings of the study by Burbage and Cameron were published in the Journal of Sports Sciences. It found that breast pain was experienced most frequently during the sitting trot, and that 21 per cent of participants with symptoms reported that breast pain affected their riding performance. [adrotate banner=”39″]The trot and canter involve large vertical movements of the horse’s body, requiring considerable effort by the rider to maintain postural stability. This effort may be higher for women with larger breasts due to the greater breast momentum created, which may affect their performance and overall experience in horse riding. Although sports bras were the most frequent type of bra worn for horse riding, only 14 per cent of small-breasted riders and 19 per cent of large-breasted riders opted to exclusively wear a sports bra when they rode a horse. “Perhaps this is due to the vast majority of sports bras available for purchase being marketed towards runners, leading to the perception that sports bra use during other sports such as horse-riding is not important,” Burbage said. “More work needs to be done in the bra industry to improve shoulder strap design, as well as more awareness of how shoulder straps should fit in order to improve the wearer experience. The authors concluded that educational initiatives were needed to ensure female horse riders were informed about appropriate bra fit and breast support during horse riding to increase comfort and help reduce the potential negative associations with performance. Copies of The Rider’s Guide to Bras can be downloaded from here, or obtained free by ordering from the BETA online shop, or by contacting Laura Clegg in the BETA office, email laurac@beta-int.com or telephone 01937 587062.